ya van a ser las 3 de la mañana y no termina por darme sueño... Aquí esta mi versión de wolverine! espero les guste, es una onda mas animal y toon... saludos! Very cool take on the character! Well done! all your arguments or future arguments are forever invalid. Epic! Love this so much! I have no idea what the creature is you have combines Wolverine with, but it's very well executed and funny as well. Well his name is Wolverine. So that's gotta be an aardvark or a pangolin. can i keep him as a pet PLEEEEEASE? Okay, but YOU have to take care of him. You have to feed him, clean up after him, make sure he doesn't slaughter the neighbors, and, if he does, get rid of the evidence. 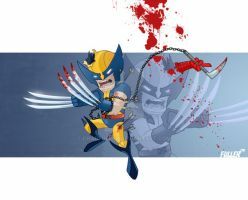 Okay, now go buy an adamantium chain and collar, you little rascal! Did you get him 200 pounds of meat to keep him from eating the neihbors? Aaw ^^ Can I keep him, can I keep him?! Oh my GOSH! this is amazing. lol wolverine and he's a wolverine. got it ?? oohhhh... i have sutch bad humor. I love it when people take comic characters and put them in there own vision.